Does it resemble something familiar? You'd be surprised how many people have absolutely no idea what either of those photos are. One of my favorite movies is The Big Lebowski. There is a scene where the German Nihilists stop at Dinah's Original Pancake & Chicken House. One orders "ze pigs in ze blankets." 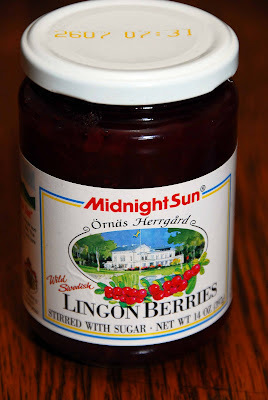 The other orders "ze lingonberry pancakes." The next step is making really good pancakes. You can use my recipe if you like. 1) Whisk eggs, oil, butter and buttermilk in a bowl. 2) Stir in the rest of the dry ingredients. Leave a few lumps. 3) Cook pancakes in a tiny bit of bacon grease. To serve, put 2 pancakes on a plate. 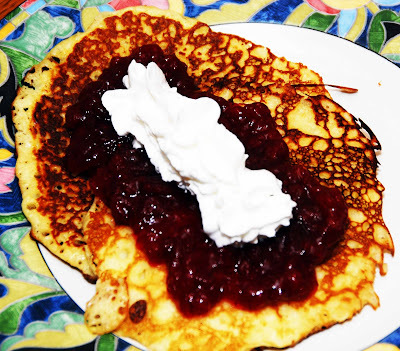 Put a little dab of lingonberries over the top and finish with a dab of whipped cream. While we were in the combine, Our Man In the Field flipped on KNUJ 860 AM, a station out of New Ulm. They had some absolutely delicious polka music. The best thing is that you can listen online if you so desire. You know that my computer has been tuned to KNUJ.NET all day long! 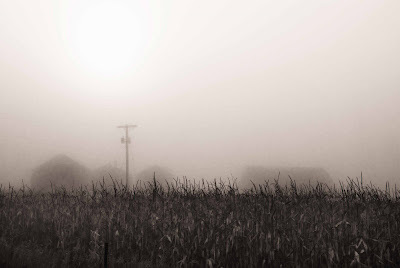 Yesterday I went up to Ledyard to take some photos of the fall corn harvest. Before we went out we had a delicious lunch of roast beef, with potatoes and carrots, gravy, cole slaw, bread and butter, and apple crisp for desert. It was so windy that we had to wait for a break in the wind to open the huge doors on the machine shed to get the combine out. A quick inspection revealed it was in good working order. I rode for a few passes in the cab. Our Man In The Field kept a sharp eye on the ground. You have to constantly adjust the height of the picker so that it doesn't run into the ground. 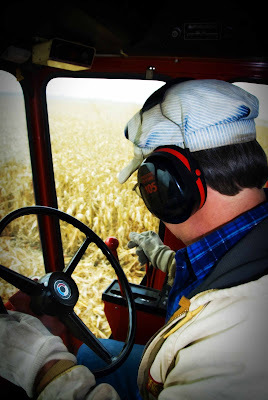 You also have to adjust the speed almost constantly so that the picker doesn't get behind. Thank goodness for the hydrostatic drive. 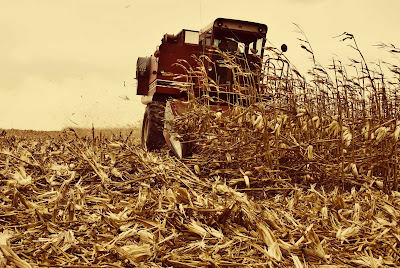 What wasn't obvious to me before actually participating in the harvest is that the combine is just the eagle of the harvest. There are lots and lots of field mice running around making things work. The entire time the combine is running, another tractor needs to be hauling grain away from the field. Here one is sneaking up behind us, piloted by none other than the Old Man In The Field. 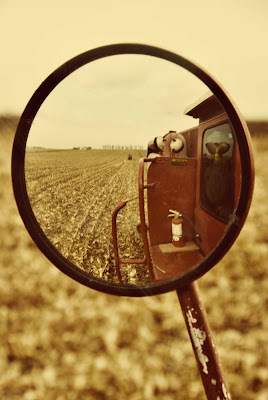 If you want to shoot a lot of pheasants, stand at the end of the row as the combine comes out. Oftentimes a pheasant will fly out. 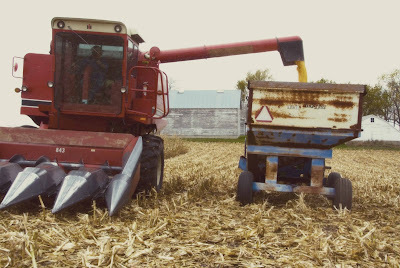 At the end of each row the combine has to dump corn into wagons. It takes about 3 passes through that particular section of the field to fill a 275 bushel wagon. 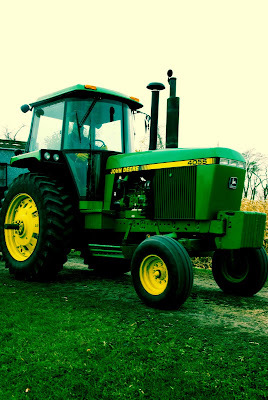 Once it is full, the wagon is hooked to a tractor and pulled over to the elevator. You have to regulate the corn flow coming out of the wagon by turning a wheel that opens a door. 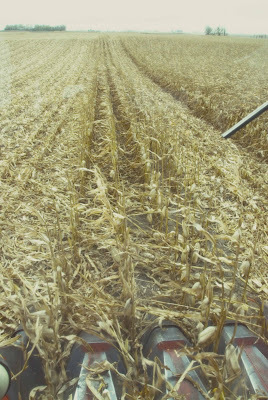 You can't have too much or the auger will overflow. 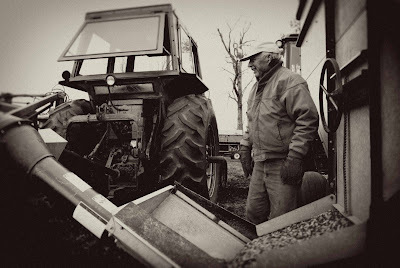 You can't have too little either, or the auger will shake and cause damage over time. 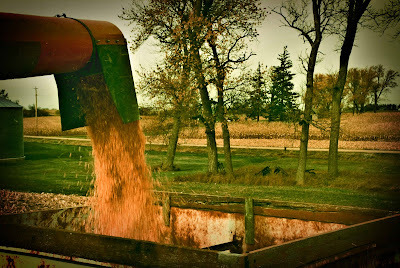 You have to watch carefully so that the wagon doesn't empty and leave the auger with no corn. 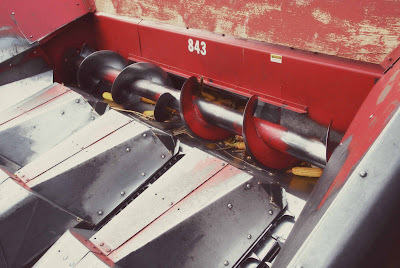 If there is no corn and the auger is running it will vibrate and cause more wear and tear. A hint that the wagon is getting low is that corn husks and cobs will start coming out of the wagon. The lighter stuff is on top after all. We worked about 4 1/2 hours and got 8 wagonloads of corn into the bin. All were pleased. For dinner we had some tasty chili and a sampling of my homebrews. 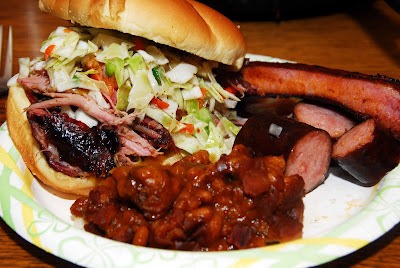 I have a few favorites for BBQ in Kansas City. My top 2 favorites are Oklahoma Joe's and Arthur Bryant's. Arthur Bryant's is kind of a hole in the wall place off of Brooklyn avenue. They have a saltier sauce that I like really well. Oklahoma Joe's was in a gas station up by KU where I did my general surgery. The first time I had Oklahoma Joe's I was on an ER rotation as an intern. The fries were delicious! 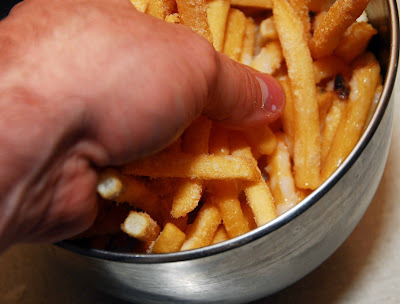 One of the ER nurses went so far as to call the cocaine fries. I toiled away for a long time to figure out how they were doing it. 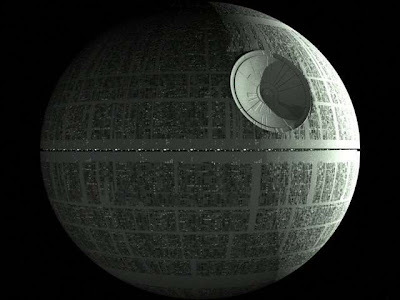 I finally figured it out. Every time I have served these fries there has been a mass gobbling. It is easy to make them. Coat some french fries in milk real quick and move them to another bowl. 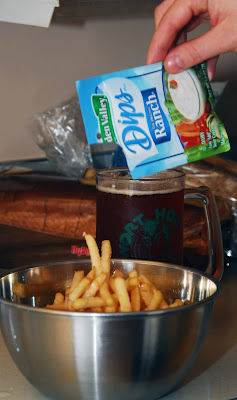 Sprinkle dry Ranch Dressing mix over the fries. 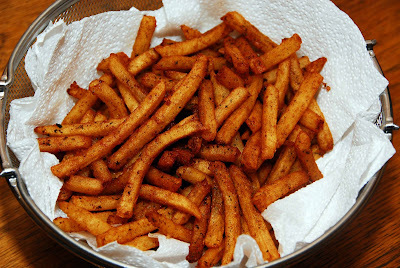 Fry the seasoned fries and let cool a little. Devour. WARNING: DO NOT POUR ANY TYPE OF CHEESE SAUCE OVER THESE FRIES. THEY WILL BECOME DANGEROUSLY TASTY AND YOUR HEAD WILL EXPLODE. 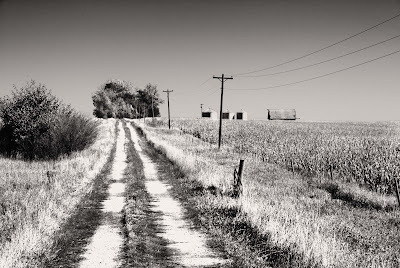 I pass a neat little farm on the way to town every day. I decided to take 2 photos of it in different conditions. 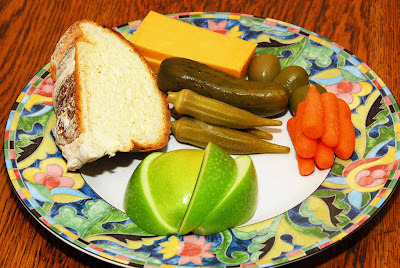 Today I had a classic of the English Pubs - a ploughman's lunch. They are easy to put together. All you need is a hunk of bread, some butter, a hunk of cheese, a pickle or 2, and maybe some carrots, vegetables or a half an apple. Readers may remember my posts about my BBQ style back in July. Click on this link to check out my recipes. We had basically the same meal tonight only with a pit-style smoker. As you can see, my pulled pork was served the Carolina way with the slaw on the bun. I also used a mustard based sauce for my sandwich. Also pictured are Erik's Mom's Beans, smoked sausage and some ribs. 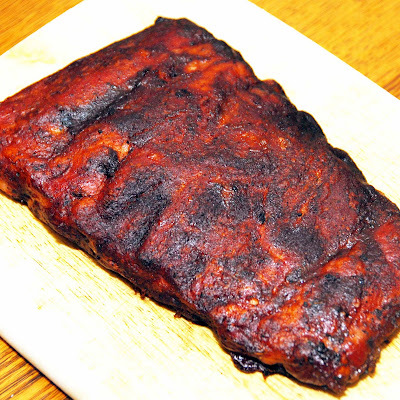 Ribs are easy if you follow the instructions. Sausage is easy too. 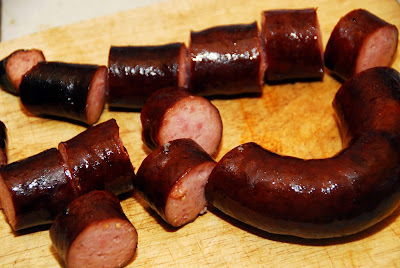 Towards the end of cooking just throw a Polish Sausage on the grill. 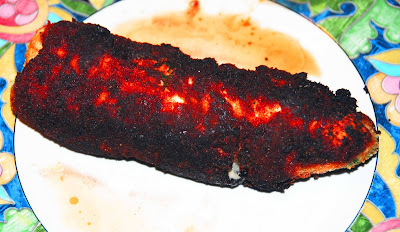 Just make sure not to cook it too long. you don't want it to dry out. Good pulled pork is another matter entirely. This one smoked 14 hours between 190 and 210. It pulled apart with ease. Almost all of the fat was rendered away so that what was left was lean juicy meat. The outside part gets a little crispy. The outside is called Mr. Brown. The inside part stays nice and juicy and white. 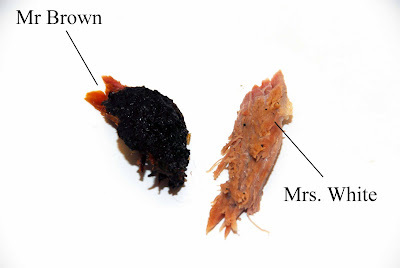 It is called Mrs. White. You know who begged almost constantly and even raided the garbage can a couple times. I found some in the stores today. 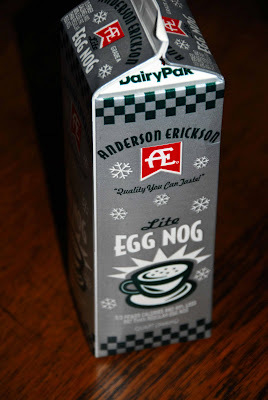 It is the official start of my favorite time of year! My old smoker recently finished its lifespan. The bottom pan rusted out. Earlier this week I was in Kansas City for a test. I went around to various BBQ supply stores and none of them had a pit-style smoker for under $700. Thank God for craigslist. 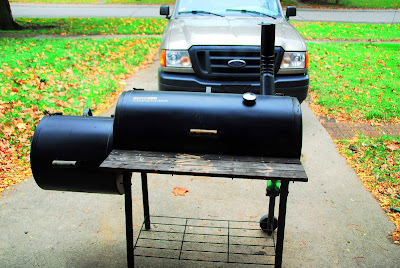 I found a perfect pit-style smoker for $100. My old smoker was a water smoker made by Brinkmann. 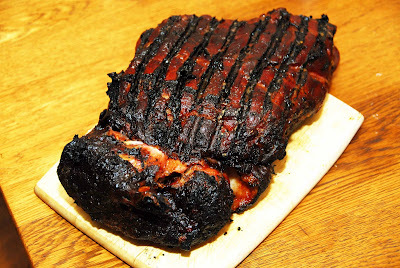 It smokes food with a pan of water in the smoker to humidify the meat. My new smoker is a pit smoker. 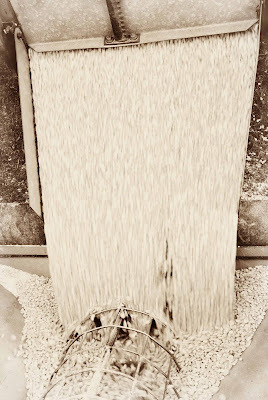 There is no water pan in my pit smoker although it would be easy enough to add one. You all may remember that filthy wealth redistributionalist Che Guevera? If not, he was a murderer and torturer who believed that he had a right to steal from you and give the money to someone else. Apparently Obama, with his "we're going to spread the wealth around" comment, has at least something in common with Che Guevera. For whatever reason, Che Guevera literally became a poster boy for the political left in the United States. 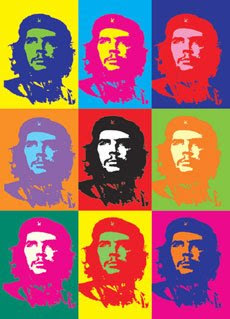 Andy Warhol did a screen printing of Che Guevera that is fairly famous. 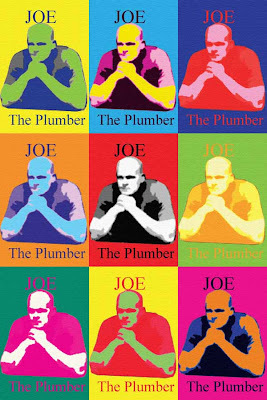 Last night's presidential debate has elevated Joe the Plumber to a household name. He is now the Anti-Che-Guevera. 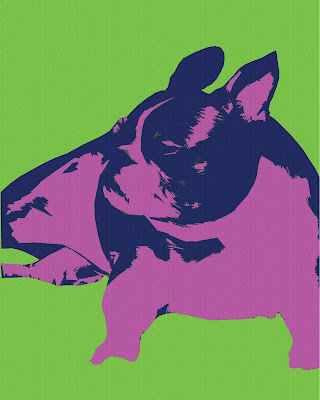 Because of his new status I made a quick screen printing of Joe the Plumber. That is my tribute to those who respect all rights, including personal property rights. 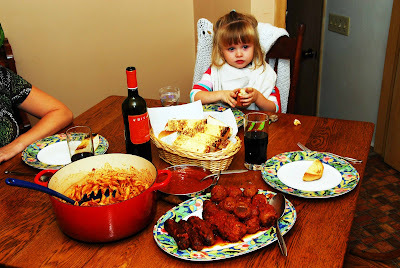 I have been making a simplified version of "Sunday Gravy" for many years. I got my first recipe for Sunday Gravy from a patient of mine when I was a medical student in Chicago. Since then I have seen literally hundreds of recipes. They are all good. For Columbus Day I decided to make a pot of Sunday Gravy the more complicated way. One defining characteristic of most recipes is the cooking of meat in the sauce over low heat for several hours. 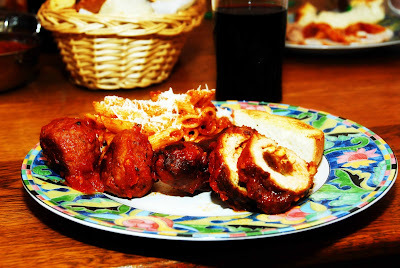 Most recipes include several types of meat like sausage, meatballs and some sort of beef or pork cut. Most times when I make marinara I just use a pork chop and some meatballs. Mine usually only cooks for an hour to an hour and a half. I do something unique when I make marinara, at least I have not seen anyone else do it or reference it in a recipe. After the sauce is cooked I take the meat out and throw the chunks of tomato still in the sauce and a little sauce and blend it until smooth in the blender. I return the blended sauce to the pot and cook just a little more until heated through. What the blending does is make the sauce a little pinker. I don't like the taste of overcooked sauce so I usually only cook it for an hour to an hour and a half. I decided to make a version that included sausage, meatballs and a pork bragiole. Many families will make it that way or use pork spare ribs or a beef bragiole. Start by searing (high heat) the pork bragiole in olive oil in the bottom of a big pot. When it is done remove it from the heat and fry the sausages. Don't worry about getting things completely cooked, just seared. Remove the sausages from the pan. 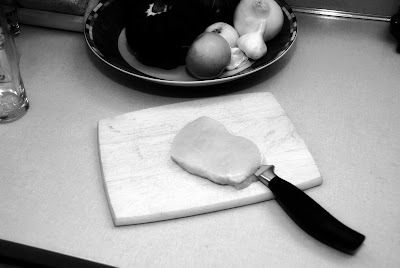 Reduce the heat and saute the onion and garlic until they turn translucent. Next add your tomatoes. Crush the whole peeled tomatoes either with your hand before putting them in the pot or with a potato masher after they are in the pot. Return the seared meats to the pot along with the meatballs. Add a couple dashes of crushed red pepper, some black pepper, the oregano and basil to the pot. 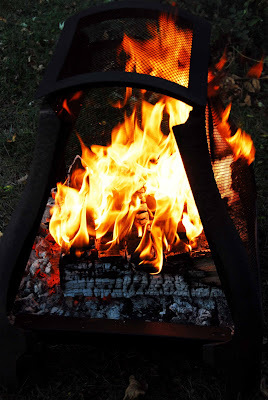 Bring to a simmer and simmer, uncovered for at least an hour or up to several hours. Stir occasionally. Taste the sauce and add salt as needed. I don't like an overcooked sauce so I usually don't go beyond 2 hours. Add water if needed. When you are done cooking remove the meats to a platter. Take some of the sauce and tomato chunks and blend in a blender until smooth. Return to the pot and stir until well combined. The blending is an optional step but it makes the sauce a little pinker and creamier. Serve with your favorite pasta. PS - the bragiole is delicious! Shown here with penne pasta. Pork Bragiole is a piece of pork rolled up like a jelly roll and filled with some tasty toppings of your choice. They are then breaded and fried in olive oil. They can be eaten as is or added to marinara as a flavoring. Here is how I do it. First take a pork chop and slice it almost in half, leaving a small bit intact so that you can fold the pork chop open like a book. 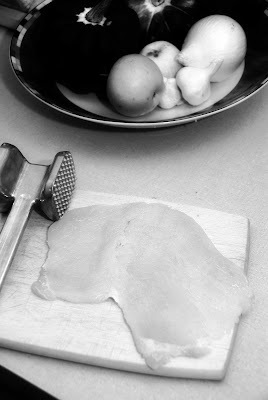 Next pound the pork cutlet out until it is nice and thin. In the center place a few regular raisins, a few golden raisins, a few pine nuts, a little freshly chopped parsley and a healthy pinch of Romano cheese. Next make an egg batter by beating 2 eggs with a healthy pinch of parsley, a healthy pinch of black pepper and a healthy pinch of Romano cheese. Bread the bragiole by dredging first in flour, then in the egg batter and finally in bread crumbs. Now fry the bragiole in olive oil and add it to whatever sauce you are making. Suggested listening music: John Mclaughlin - Electric Guitarist. Tonight we all went with Easy E and family to the Holy Rosary spaghetti dinner. I won't go in to the whole history but it has long been a big tradition in my home town. It was started by some Italian ladies a long time ago. They serve you a plate of spaghetti with 3 meatballs, bread, salad and a desert for $7. The proceeds to go a good cause. One of the neatest things was that as I was walking through the door and down the basement steps I could smell the sauce and I knew it would be good. They used to serve the leftovers at my high school for the couple years that I went to a Catholic high school. It tasted exactly like I remembered it. The meatballs also tasted exactly like I remembered them. I had a slice of coconut pie for desert that was to die for. I think wars have been fought over pie and spaghetti that good. The spaghetti sauce is extraordinary. It is made the right way without cutting corners. They use quality ingredients and they don't skimp. If you do a google search for "Sunday gravy recipe" you won't get Holy Rosary's recipe but you will be on the right track. There is a place called Baratta's in Des Moines that has a similar sauce, but it certainly isn't any better than Holy Rosary's sauce. I like the cafeteria style dining at church functions every once in a while. It was an added bonus. I was also amazed at the organization of the whole affair. They serve >2000 people in 4 hours and it runs smoothly. I might be able to make the sauce at home but I could never duplicate the superb efficiency with which Holy Rosary runs their event. 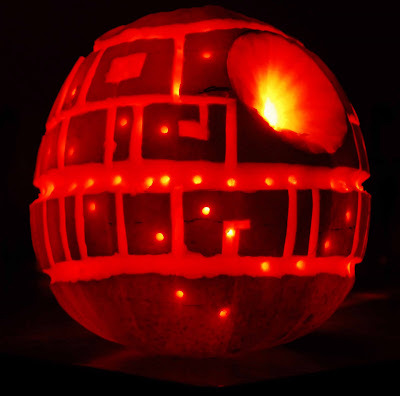 I thought it was a job supremely well done. This isn't really the best photo but it illustrates life in a small Iowa town fairly well. I had just enough time to grab my camera and shoot it. There was not time to get a good exposure or even get a decent composition. Last night when I was tending the fire numerous tractors pulling empty grain carts and a combine drove by. There is a grain elevator down the street from us. 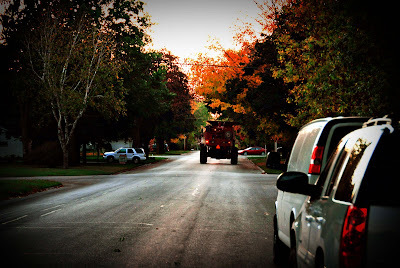 I've never lived any place in which a combine drove by the front of my house. 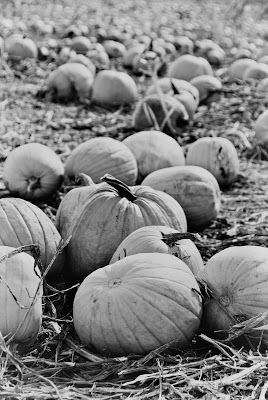 What would a fall photo series be without the obligatory field 'o pumpkins shot? We made a really tasty vegetable side last night. I got the recipe from the book The Cuisines of Spain. It comes from an area of Spain called La Mancha. It is an agricultural region a lot like Iowa. 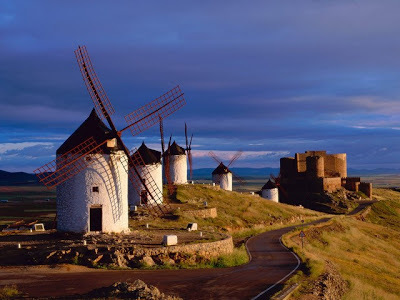 You may have heard of Don Quixote de La Mancha? Maybe not. Oh well. The region is famous for its windmills. You need 2 saute pans. Heat both pans and add a healthy amount of olive oil to the bottom of each pan. Saute the onions and peppers in one pan and the zucchini in the other. Sprinkle both pans with salt and pepper. When the zucchini releases all of its juices and is soft, drain the juices. 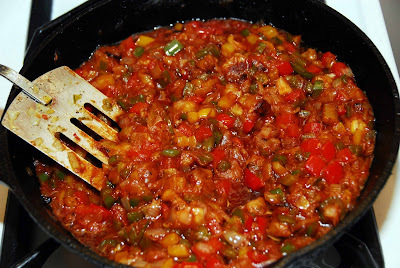 Combine the sauteed onions and peppers with the zucchini. Dump in the tomato sauce and simmer 5 minutes uncovered. Taste and adjust seasoning. The book recommends serving it with a fried egg. I think it would be outrageously delicious with a fried egg so you better not try it. Its too tasty for you. 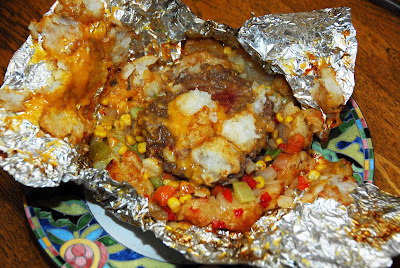 One of the ultimate camping foods is a hobo dinner. I haven't been able to camp yet this year but I did add a little something to the patio last night. Our little one helped me build the fire and even helped with the hobo dinners! They are really easy to make. 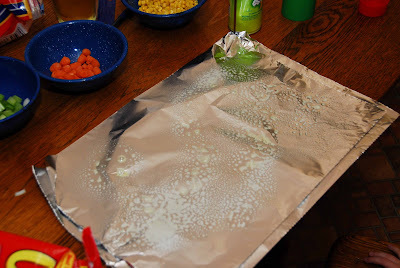 First you take a couple pieces of aluminum foil and use some spray oil on the top sheet. 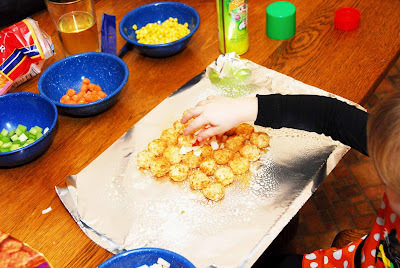 Then put down a layer of some sort of potato (I used crispy crowns) and a little onion. 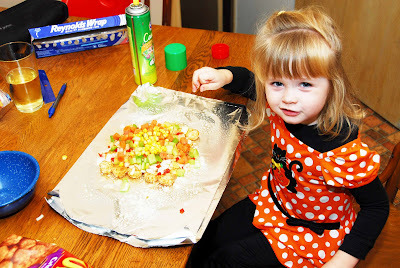 Then add an assortment of other vegies like carrots, corn or whatever you happen to have around. Next make a hamburger patty and plunk it down on top of all. Add a little cheese and whatever else you want. I wanted a chipotle pepper on mine. Make sure you season each layer with a little Lowry's or whatever you have. To cook, you need a really really really good bed of coals going. Don't underestimate how long it takes to build a layer of coals this good. 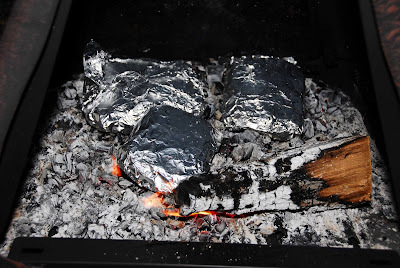 It takes at least an hour and a half to get good coals. Make sure you turn the dinners over fairly often to ensure even cooking. 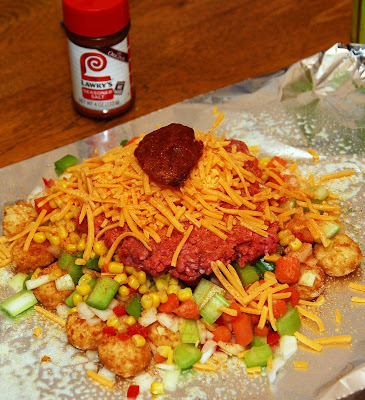 Another trick is to flatten the hobo dinner so that it is of even thickness all around. After about 20 minutes or so you should check one. It isn't done cooking until the vegetables are soft. Test the carrots. If they aren't soft throw it back on the fire. Finally, you will have a very tasty treat!